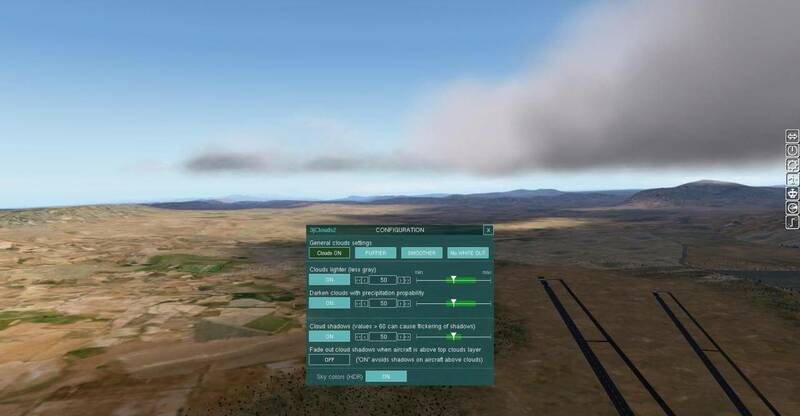 We’re pleased to host – of course with the approval of Jörn-Jören Jörensön aka 3j – his 3jClouds2 | Pimp your default clouds for X-Plane 10 version 1.3 lua script. Cloud colours: In general, the plugin makes the clouds a little lighter. The reflection of the sun is a little stronger. Cloud shadows: Cloud shadows are activated in a way, that they do not flicker, at least only very little. If you are annoyed by cloud shadows on your aircraft or in your cockpit when flying above the clouds: Activate “Fade out cloud shadows when aircraft is above top cloud layer” in the settings window. As it says, shadows will be slowy deactivated when plane is above the clouds. No white-out: No more “grey screen of death” when flying through clouds. Can be deactivated in the settings window. Sky colours: A little tweak of the sky colours, to get more blueish haze/scattering. 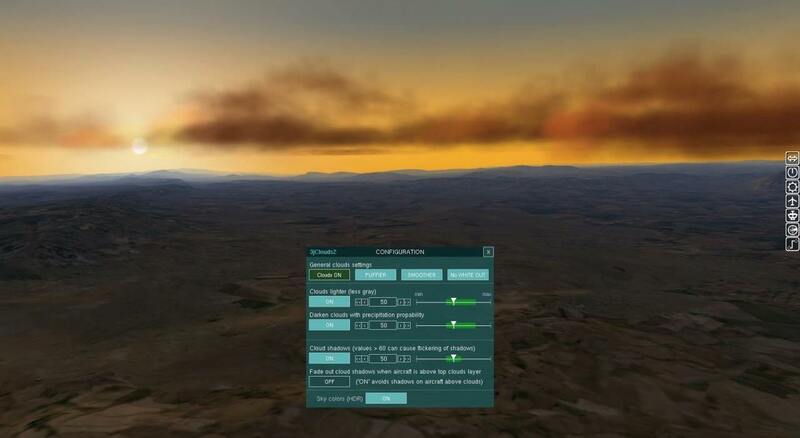 Works only with HDR activated in the rendering options of X-Plane. 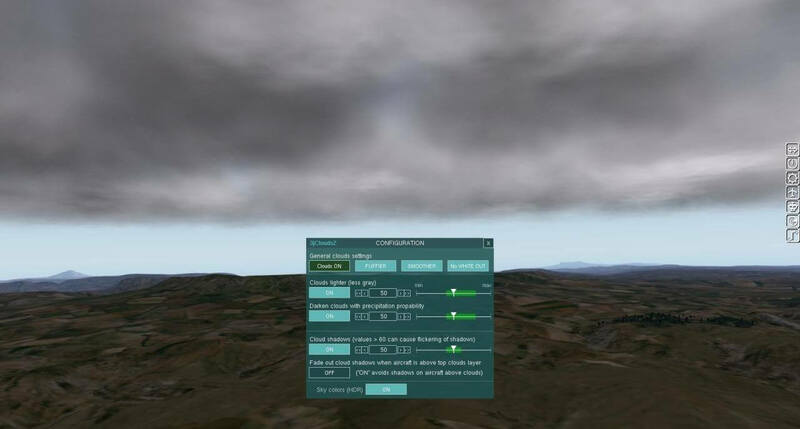 The plugin does everything by itself, depending on weather, aircraft position and camera position. In the beginning you may want do some configurations, to set it up how you like it. This plugin should not change the performance of cloud drawing, but it makes the clouds a little “puffier”. 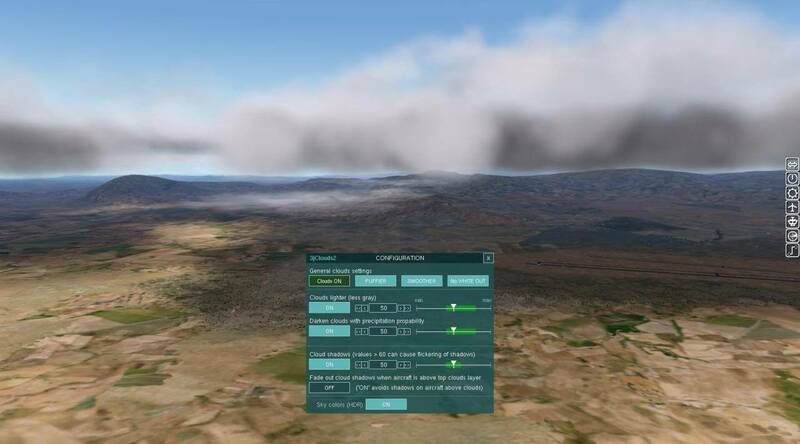 Therefore you can try to bring down the “cloud puffs” slider in the rendering settings of X-Plane a few notches and clouds will still look good. This might give you some better performance in cloudy conditions. “PATCH”: The plugin will change the RTH script a little, so that it does not set these parameters, as long as 3jClouds2 is running. When 3jClouds is inactive or de-installed, RTH will work exactly as before. So you don’t need to worry, anything gets destroyed… (To be absolutely sure, a backup copy of RTH.lua script is saved: “RTH.lua_jjjLib_BACKUP”). This is the recommend option, as it gives you full clouds functionality of this plugin together with RTH doing all the rest of it’s very good job. “Rain cl./shad. OFF”: Simply turns off the “Darker rain clouds” and “cloud shadows” function of 3jClouds, to avoid the problems with RTH. If you should turn them on again later, the alert box will open up again to remind you about the problems. The plugin in some cases has to turn the clouds completely off and on again, when changing the configuration. On my system, in a very few occasions, that caused X-Plane to stop (after some black flickering of the screen). After you have found your favourite settings, usually you won’t change them anymore and so – I hope – this won’t be a big issue. A friend of mine had some more crashes and sometimes completely black clouds, but I could never reproduce that on my computer. If you should have any problems, bug reports or support questions, please use the COMMENTS tab! Please do not use the reviews tab for this Kind of feedback, it is not possible to reply there. This plugin uses some inofficial control parameters (so called “DataRefs”) of X-Plane. Though this is kind of a hack and something a programmer should not do normally, I did it because the effect of the plugin is really cool. These inofficial DataRefs are undocumented and can change with every release or update of X-Plane. So it is not guaranteed at all, that this plugin will work with later X-Plane versions. When you install this plugin, please keep that in mind and don’t blame the developers of X-Plane, FlyWithLua or me, if the above said should happen!